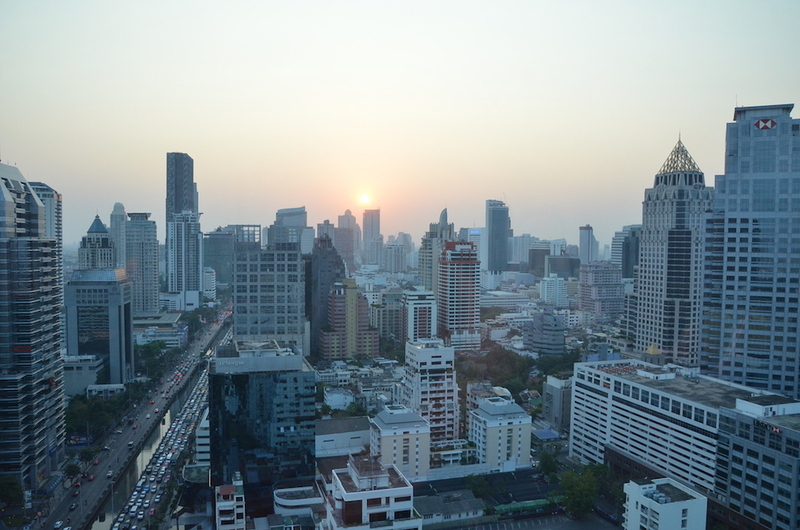 Bangkok, or Krung Thep Mahanakhon Amon Rattanakosin Mahinthara Yuthaya Mahadilok Phop Noppharat Ratchathani Burirom Udomratchaniwet Mahasathan Amon Phiman Awatan Sathit Sakkathattiya Witsanukam Prasit (yes, that is the city’s full ceremonial name) is a sprawling metropolis that can be overwhelming if you only have a few days to explore; but if you give it a chance, it may just get under your skin and you’ll be craving the Thai way of life and the bright city lights. 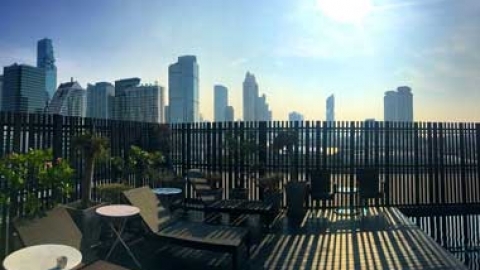 Bangkok has the perfect combination of modern and traditional, old and new. 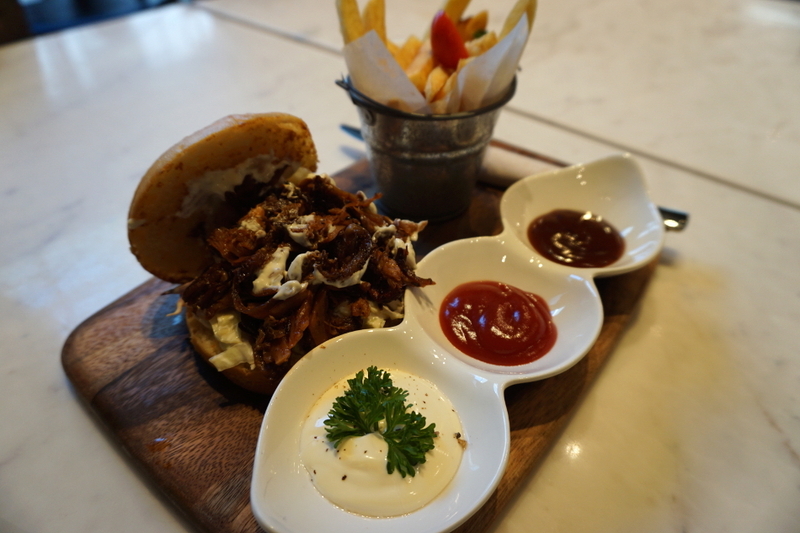 There are luxury malls aplenty, and right outside are modest local eateries. 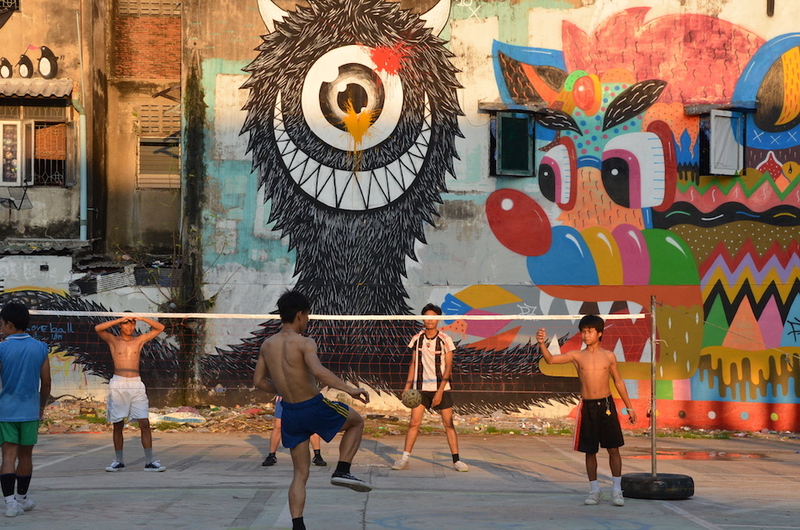 Thailand has managed to keep their culture and identity intact, while evolving into a first class city. The 7-11’s at every corner are extremely convenient, and a 1 hour metre taxi ride will cost you $7-$10. We adore the sparkling Buddhist temples, the colourful markets, the fresh fruit stalls, the local and very authentic outdoor eateries where you will find Thais slurping on soup, drinking beer, and chatting throughout the night, and the endless buzz of life in this big city. 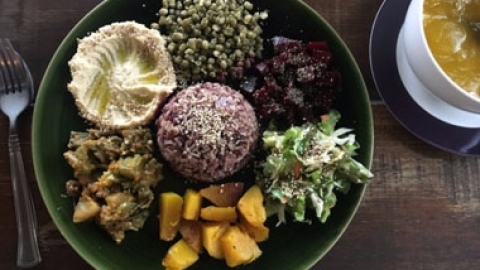 But we get it, some people just can’t do big busy cities, so if you are a Vegan in Bangkok, and all you want to do is eat, here are a handful of our favourite places to grab a good vegan bite. 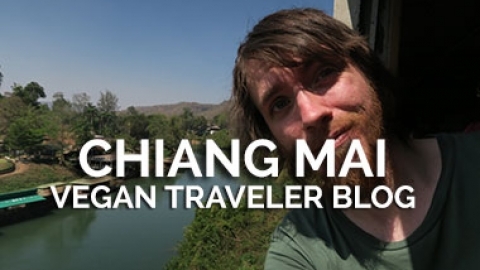 ***Bangkok is huge, so I split this up into 2 sections-the Sukhumvit area, and the Khao San Road area. 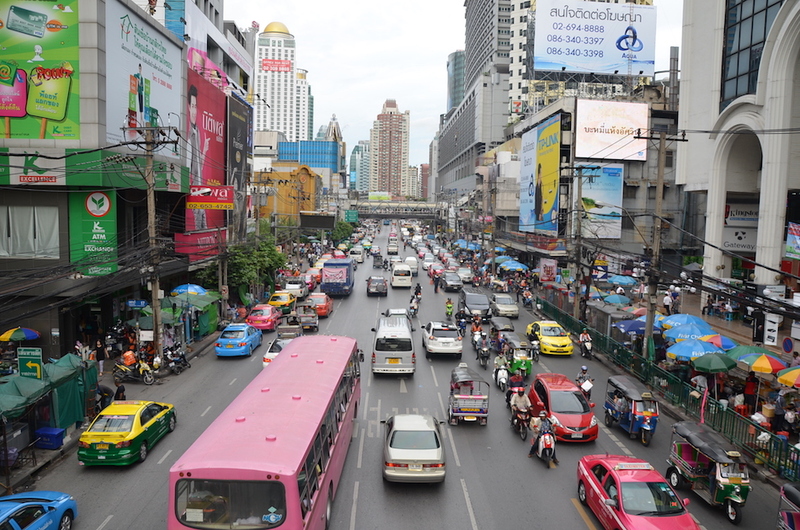 Sukhumvit is our favourite place to be in Bangkok, as it has so many great vegan options, it is on the BTS line, and the nightlife is fantastic. 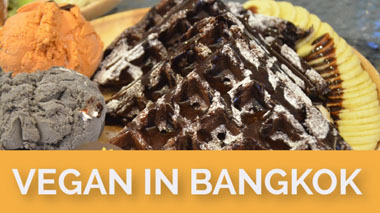 No visit to Bangkok is complete without indulging in red velvet waffles with ice cream, and chocolate fudge brownie frappes. 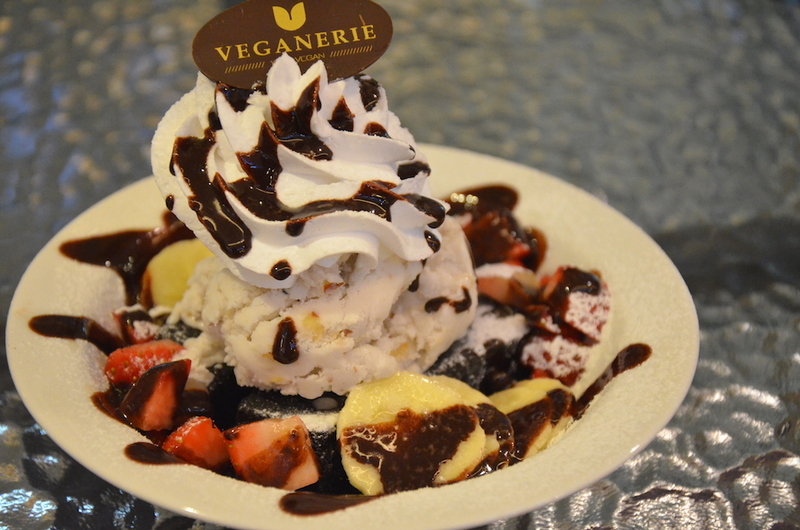 Veganerie is a 100% vegan bakery/cafe located in Mercuryville mall at Chitlom BTS station. Their creations are both beautiful and delicious. They also sell bread, pizza rolls, crepes, lattes, and sweet toast topped with fresh fruit, ice cream, and whipped coconut cream. It is all divine. 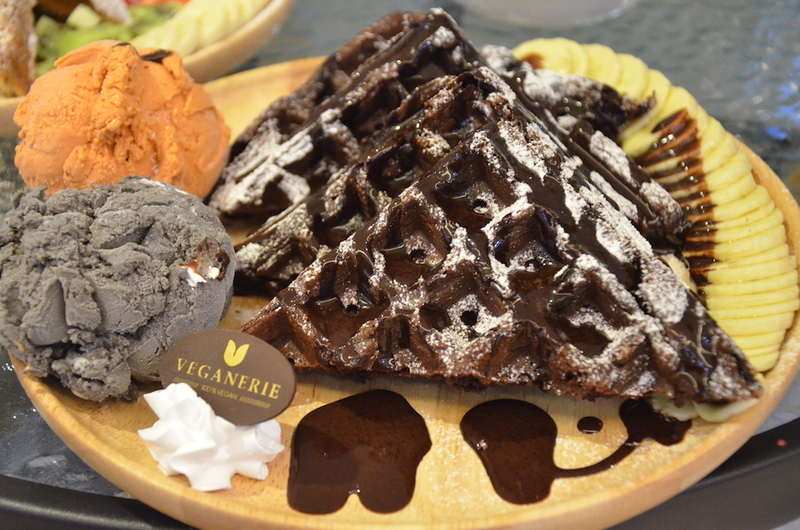 Veganerie Concept is the 3rd location for this incredible business, and it is a full service restaurant. The space has a cool industrial look, but most importantly, the food is incredible. 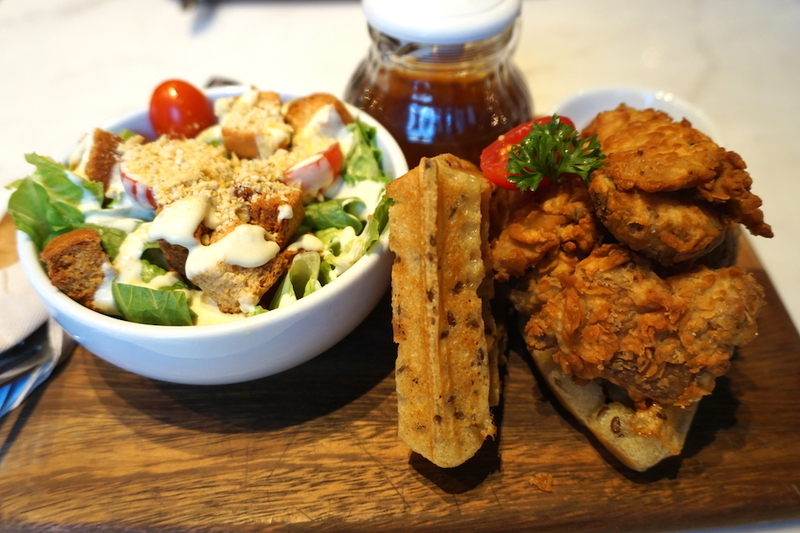 The chicken and waffles served with a ceasar salad and syrup were spot on, as was the sweet and sticky pulled mushroom sandwich served with fries and coleslaw. 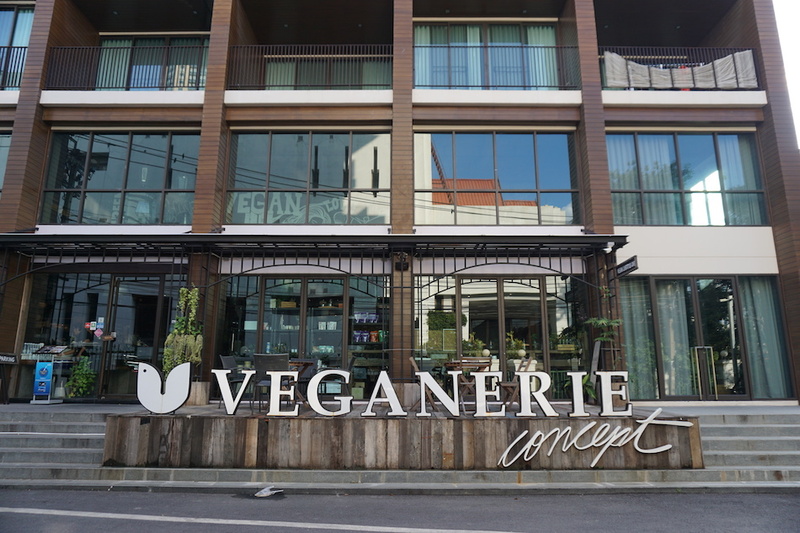 The menu is quite large and is the perfect place for a Vegan in Bangkok. You can choose from English breakfast, brunch, a scone tea set, Thai dishes, fruit salad, a club house, and yes, all of the same delectable desserts served at their other 2 locations. 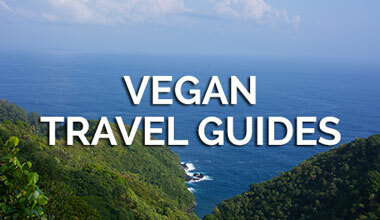 All 100% vegan. After our meals, Cody and I shared a strawberry cheesecake milkshake. It was amazing. We regret nothing! 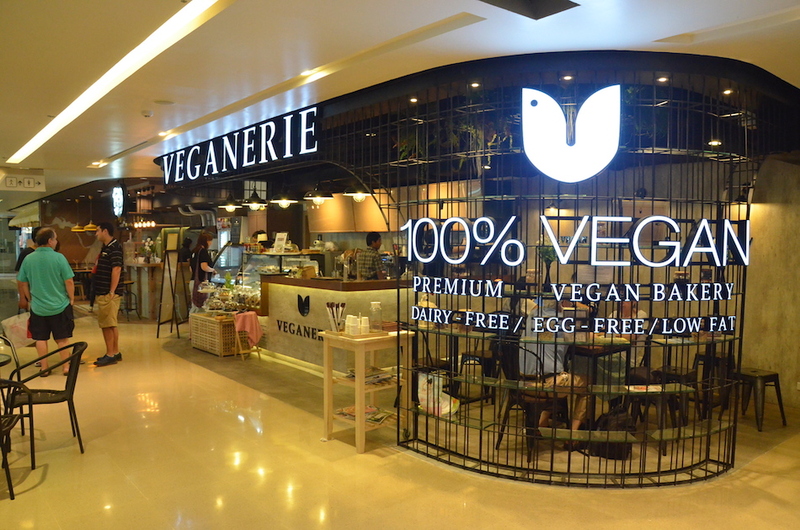 Veganerie Concept is located behind Benjasiri Park. Get off at Phrom Phong station and leave through exit 2. After a few minutes, you will see Benjasiri Park on your left. Walk through the park until the end, and exit to your left. The sign is massive, you can’t miss the restaurant. 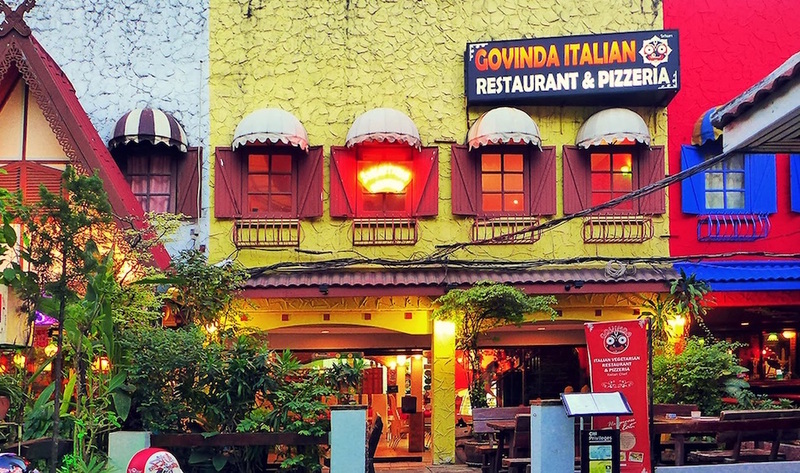 The name is a bit misleading, because Govinda is not an Indian restaurant, it is a vegan and vegetarian Italian restaurant and pizzeria. A bit on the expensive side, but well worth the incredible authentic pizza, pasta, red wine, and ambience. 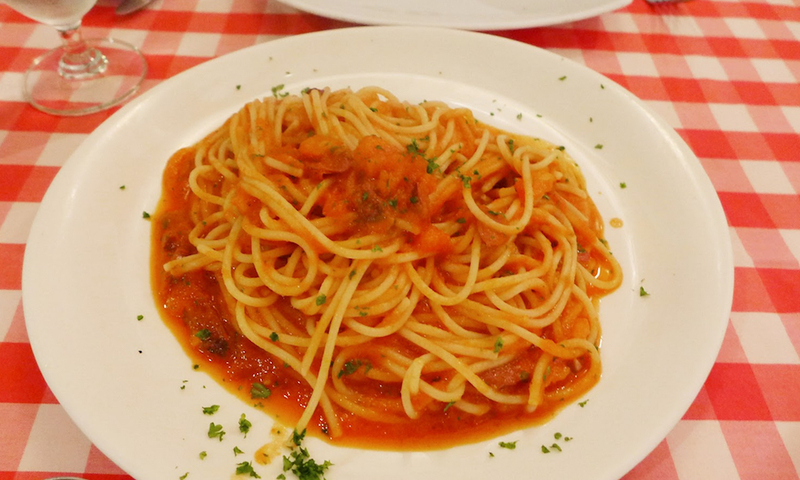 The pasta is freshly made, they serve vegan chocolate cake, the service is great, and they care for stray cats outside of the restaurant. What more could you possibly ask for? 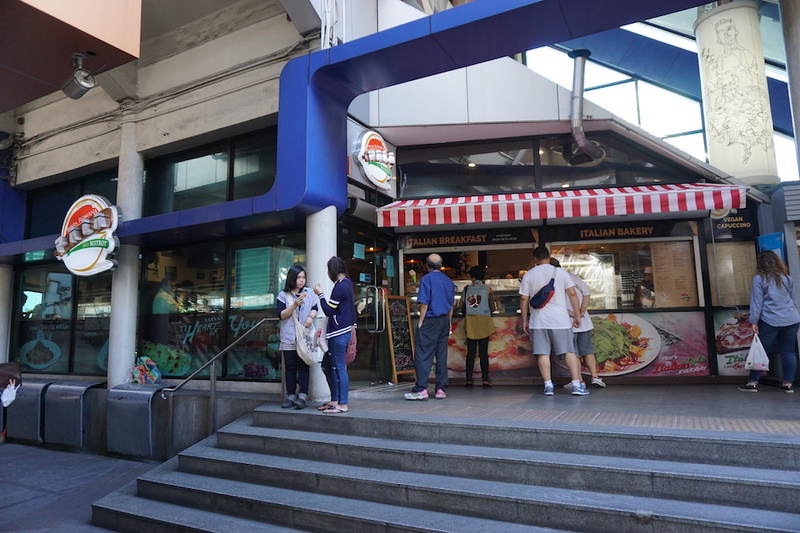 Exit at Phrom Phong station, and walk until you arrive at the holiday inn with a Dominos Pizza attached to it. Make a left onto the street, and it will be on the even numbered side of the road on the right hand side after a few sketchy bars. You know that scene in Star Wars-A New Hope, where a diverse assortment of creatures and cultures are imbibing in delights, and smoking hookah in the Mos Eisley cantina? 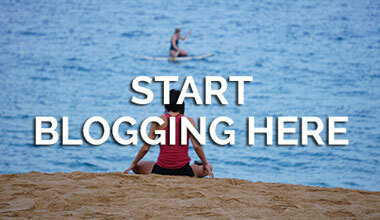 Well, that is how we describe Bamboo Lebanese Restaurant to people. Located in the Arab area of Sukhumvit, Bamboo has quite a mix of people coming through-from scantily clad Russian women, to business men, to lady boys, to completely veiled Muslim women, to Thai customers, to men sipping on mint tea and smoking shisha, to heavily tattooed couples (that’s us), and that is part of the reason we love it so much. 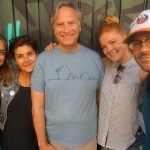 This restaurant has such a menagerie of people coming through, and everyone just does their own thing, and minds their business. 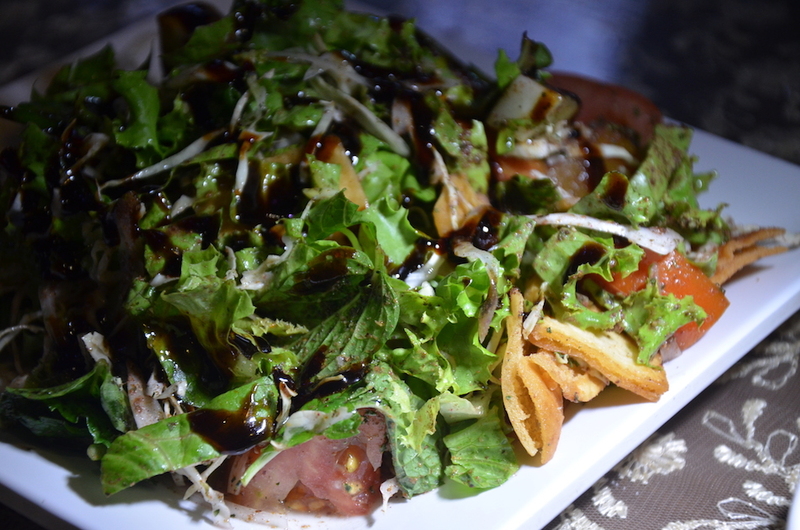 The menu offers Russian, Thai, Italian, and Lebanese food. That’s right, 4 different types of cuisine in one restaurant. Cody and I have only tried the Lebanese as so many of the dishes are automatically vegan. 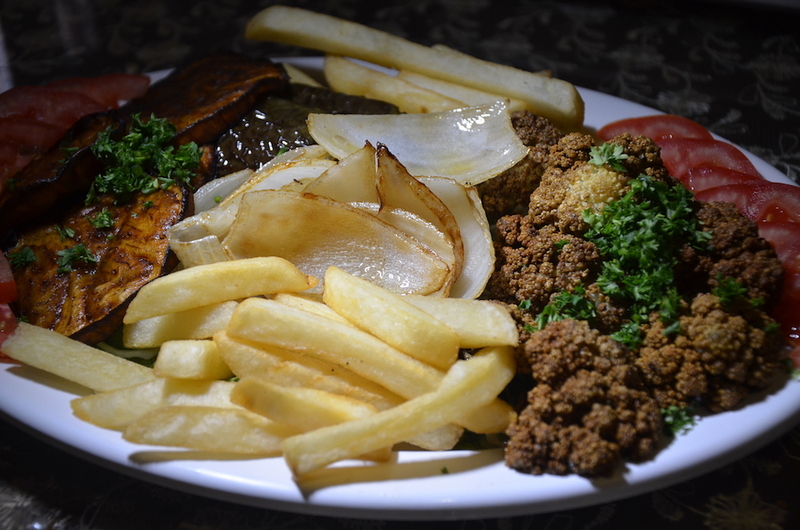 The spicy potatoes are so crispy, cooked to perfection, and delicious, you can never go wrong with their falafel, their hummus and pita are great, and so is their plate of veggies and fries, and if you have a hankering for Lebanese food at 4am, bamboo is open 24 hours. This place is just a good kooky change from Thai food in a pretty lively part of town. This restaurant has been doing extremely well in the past few years. 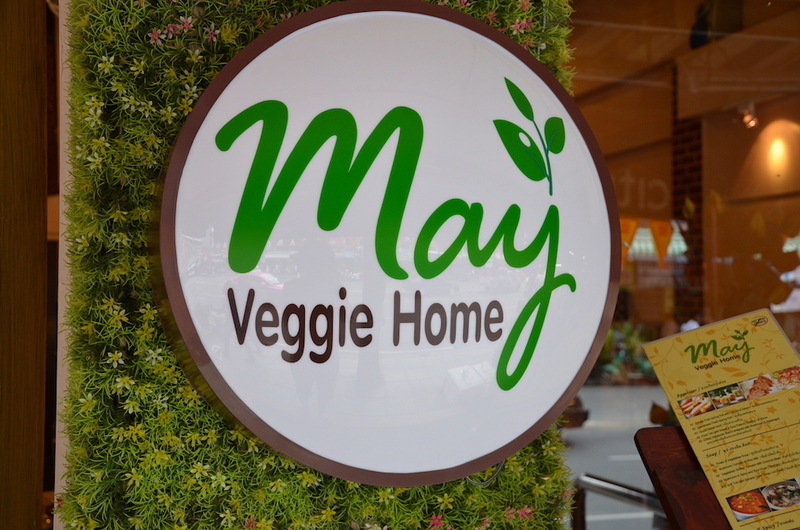 Our first visit to May Veggie Home was at a different location in a much smaller space. 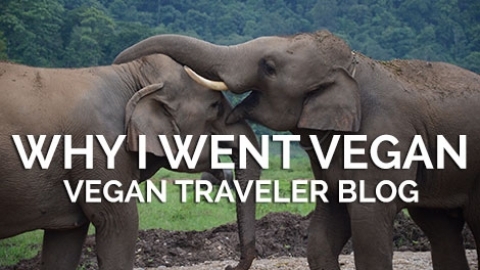 This vegan restaurant is always busy for lunch, and full of locals and foreigners. 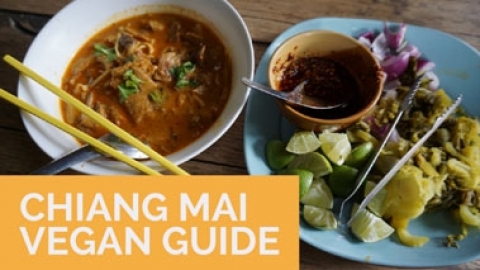 They serve a variety of western dishes, fresh salads, a vegan khao soi that I highly recommend, Japanese flavours, and a refreshing iced lemongrass water. There is also a little ice cream counter for your sweet tooth. 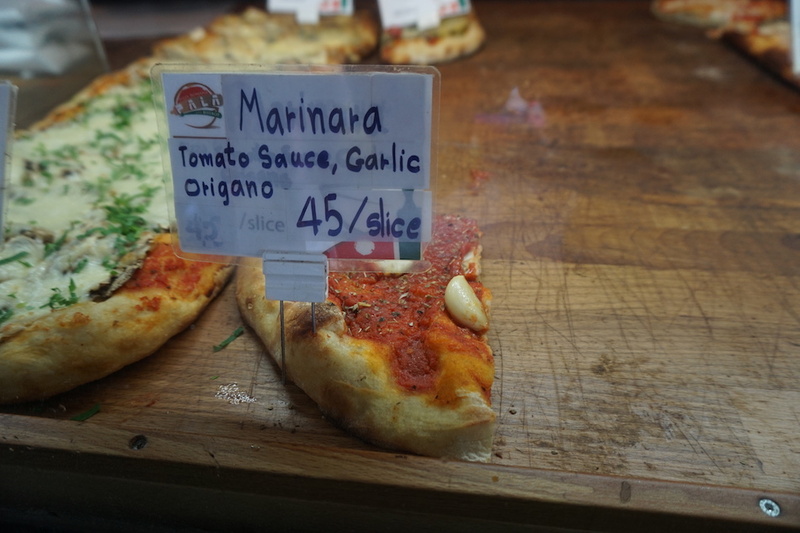 Finding Pizza Romano was a pleasant surprise as we were heading back to the BTS station from May Veggie Home. Terminal 21 is a mall attached to Asok station, and Pizza Romana is located right underneath the mall. You exit opposite of where you would exit for May Veggie Home. 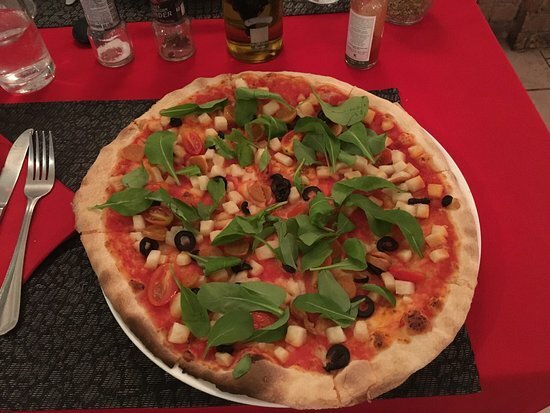 This was a great find for any Vegan in Bangkok wanting some delicious pizza. This is not a vegan pizzeria, but they have a phenomenal tomato sauce and garlic pizza for takeaway. 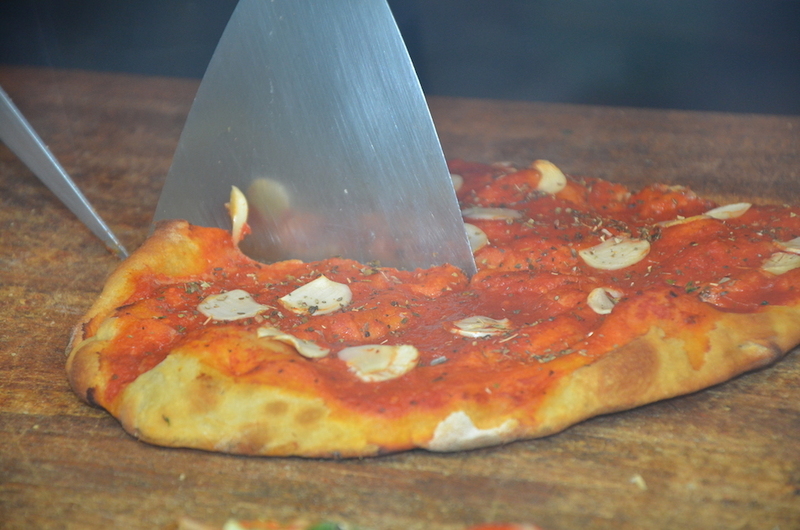 You can order at the window, and they will wrap up your heavenly slices to go. They also advertise vegan cappuccinos as well, so that’s a bonus! 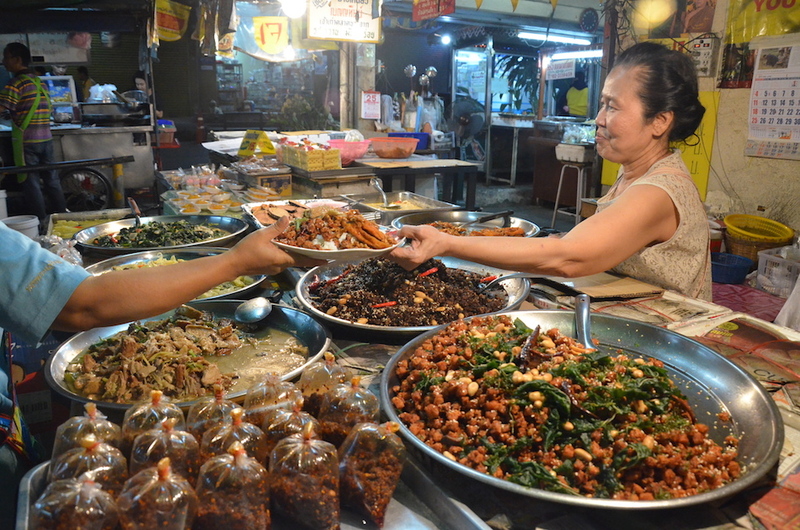 Veg lady is actually a woman that runs a Thai vegan food stall in a very local area of Bangkok where we used to live. 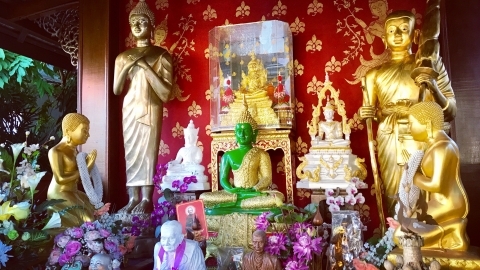 This is an area most people will never visit, but the good news is that these types of “jay” places can be found all over Thailand. 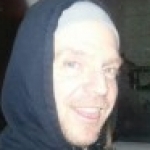 Jay is vegan in Thai and it actually translates to Buddhist vegetarian food, or “eat like a monk”. 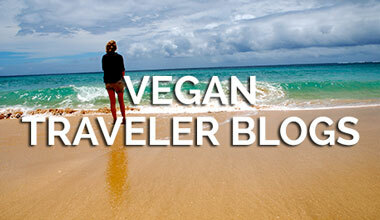 They are no frills eateries that serve vegan noodle soups, rice and veggies, mock meats, and sometimes small burgers. Veg lady always had an abundance of fresh vegan dishes for us to choose from, and she would pile on the rice with a smile. We would eat at her stall at least once a week and 2 heaping plates of food ran us about $3. 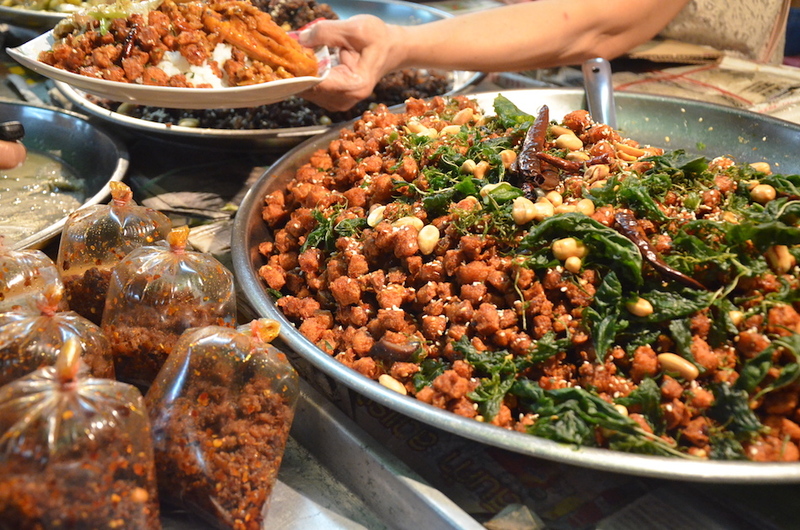 Delicious cheap meals for the Vegan in Bangkok. So when you visit Thailand, remember to look out for the Jay symbol and the red and yellow flags that usually hang over the shop. 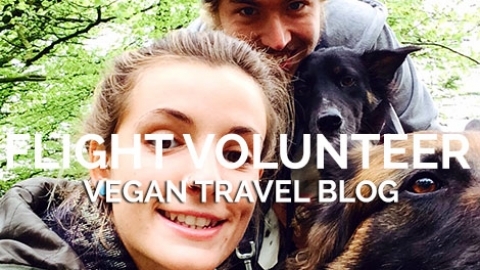 There are many Veg Ladies (and men) out there serving up cheap and tasty Buddhist vegan food. 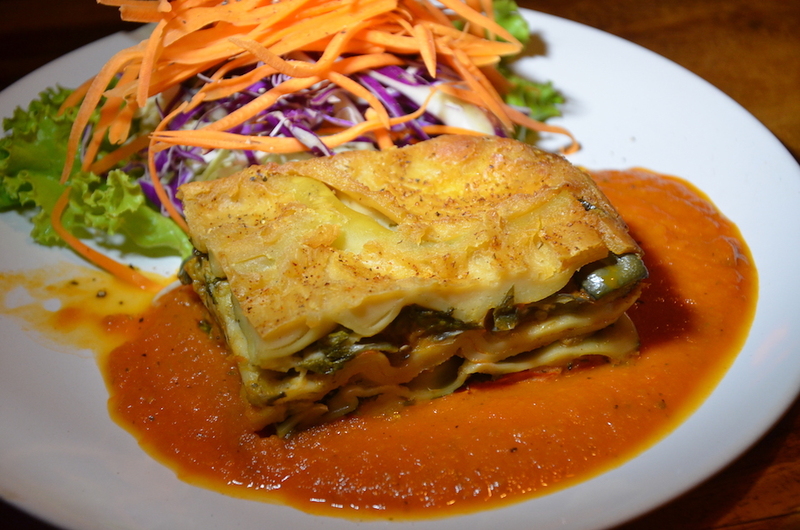 Ethos was one of the first vegan/vegetarian restaurants we visited in Thailand, and it is one of our favourites. 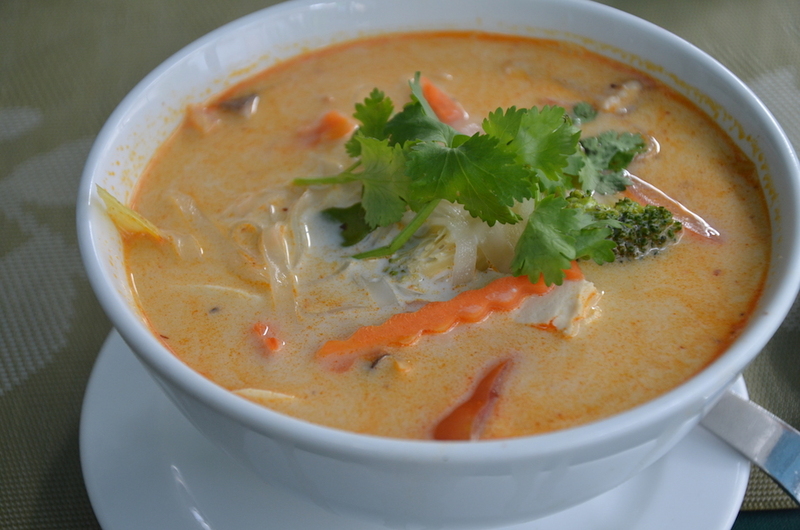 They serve international, and Thai food, and are open for breakfast, lunch, and dinner. Another great place for a Vegan in Bangkok. 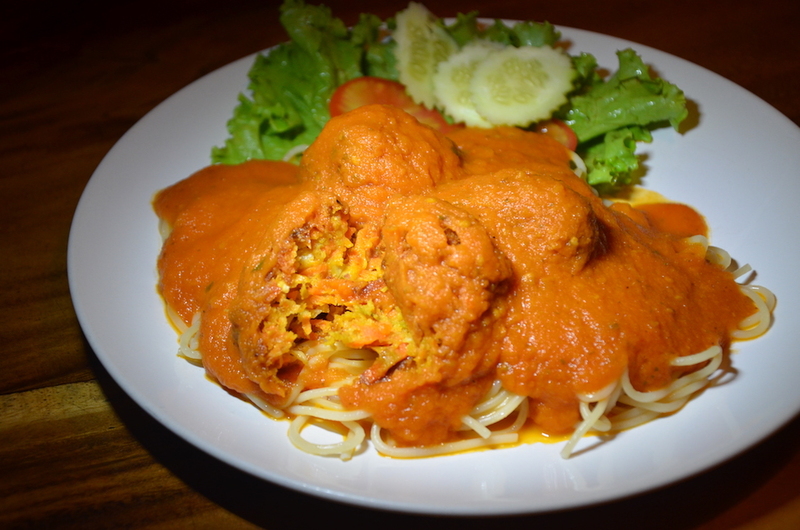 Their spaghetti and “meatballs” is one of their best dishes, and the coconut milk blueberry smoothie is divine. You can’t really fail with any of their meals. 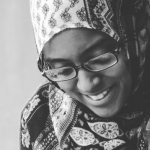 The coconut noodle soup and coconut custard dessert are also winners. This western owned restaurant has a nice laid back hippy vibe and you can choose to sit on the floor at a low table, or at a regular table. 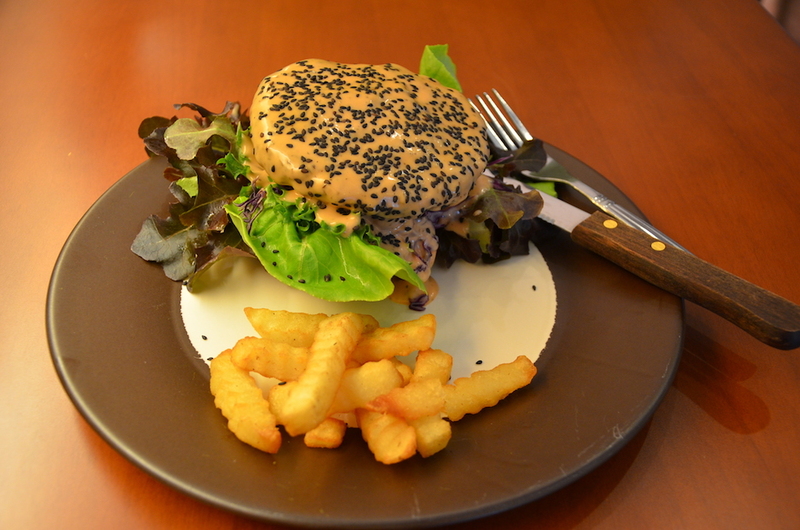 Ethos is located on the small street behind the Burger King at the end of Khao San Rd. It is pretty much the only reason we visit the KSR area. 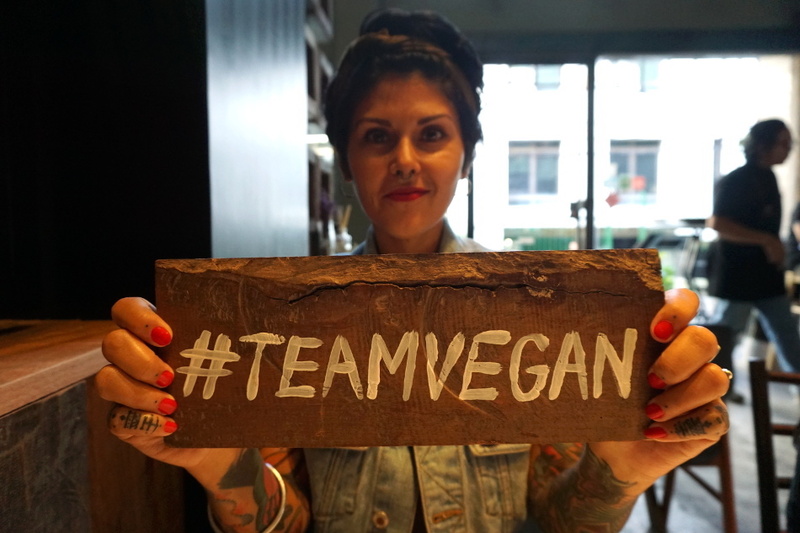 We took vegan cooking classes here and they were so much fun! 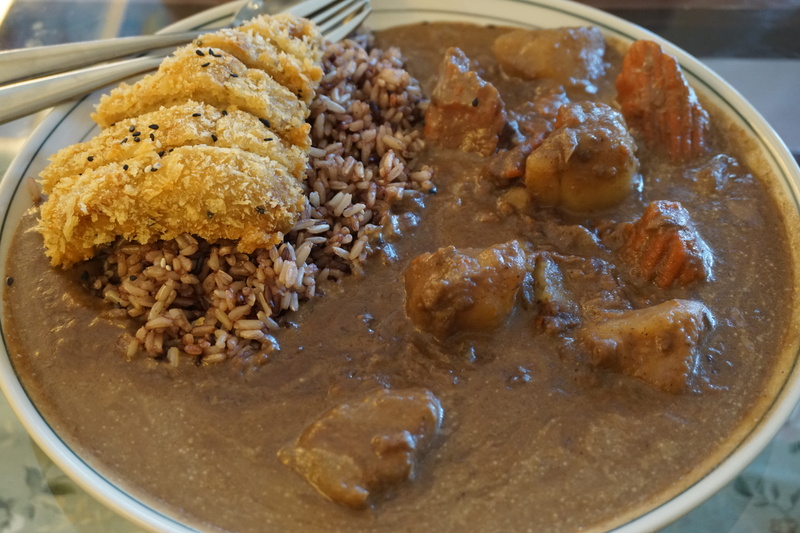 Mai Kaidee also serves fresh, tasty, and inexpensive vegan and vegetarian food. Like all veggie places, it has a nice peaceful vibe, and they also sell vegan Thai chili paste, so stock up if you visit, because most Thai chili pastes contain fish sauce. 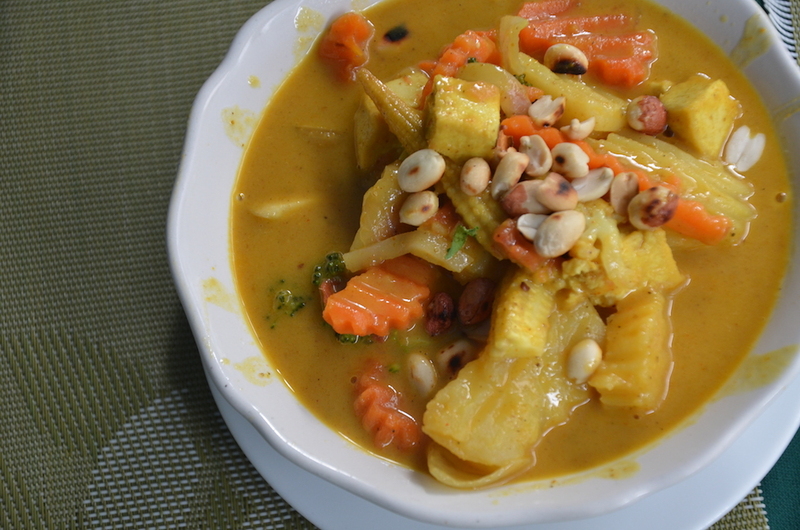 We really enjoy the pumpkin hummus when we visit, as well as the massaman curry, and the Tom yam is aloy mak mak too! 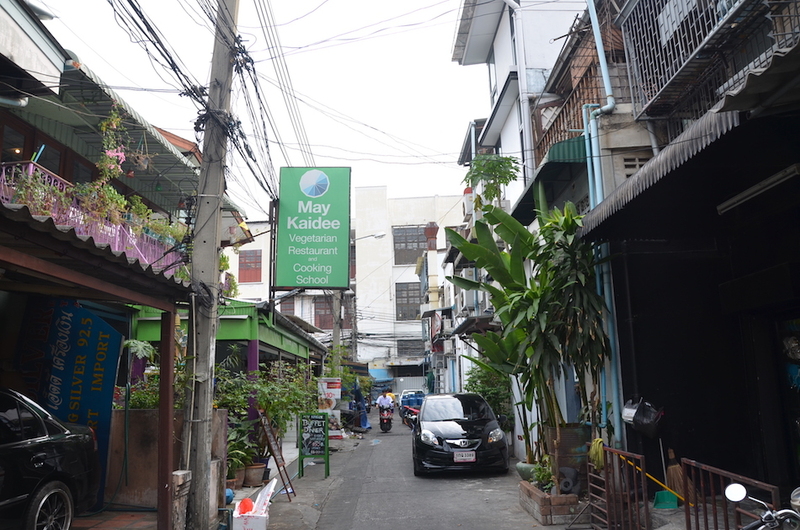 Mai Kaidee is also located on the same back alley as Ethos but further to the right (behind Burger King). 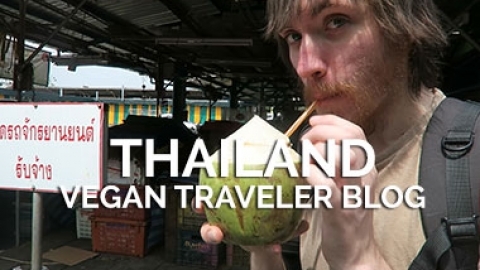 These are just a few of our favourite places for a Vegan in Bangkok, but there are so many options in this very vegan friendly city. 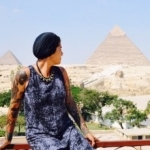 @will324 Thailand is such an amazing place for vegan/vegetarian food. Every time we come back there is a new must try place. Hard to keep up with them all.